I'm a 22 year old student who uses some spare time getting acquainted with using solidworks to tackle the design of speakers for later optimization. Please do note that i'm not very skilled so you may have to elaborate on your answers. PS: Can i use the final model to make a cut-extrude to make a primitive mould? I have attached how I would create a Nautilus. I did not plot the path very well as you did, so I could not finish it. If the path were to be mathematically correct, it should finish just fine. You will want to use the least number of ribs possible. You can see I only used one per revolution, that would be best. The tool you need is centerline loft. Use each rib as a loft profile, and then the spiral path you generated as the path. Make sure to add a "curvature to face" end condition at each transition to get a very smooth transition. Good luck! And yes, you can make a mold with solidworks. There is an entire toolbar dedicated to making molds. Create a parting line with the parting line tool. Then create the mold shape (turn of "merge entities" if it is inside the part file, or do it in an assembly as a seperate part), then use the mold split tool. There is a very nice tutorial in the SolidWorks Tutorials about how to do this, and is a good quick lesson. As a note you can create equation driven curves in solidworks. I gave it a quick shot with the log spiral and wasnt able to get it working since the equation format is somewhat limited. But this may come in handy in the future for you. I havent looked at charles' solution but i also wanted to note that you can loft to a point. Im not sure what your plan is for the end of this shape but i think lofting from your opening down to a single point using your log curve as the centerline will produce a much nicers shape than trying to model each guide. From there I would extrapolate cross sections using sketch lines for intersections with the loft and create my rings from that. If i get a chance i will give that a shot and post it here. It looks like an Equation Driven Curve won't work, because that feature wasn't available in version 2008.
charles, parametric option for equation driven curve i believe was added in 2010. 09 and older wouldnt have it unfortunately. Probably need to use Excel to generate the points, then use the Curve Through XYZ Points command in SolidWorks. That is what I would use with SW2008. Thanks for the quick replies. I will look more into it when i get the chance to concentrate on it sometime tomorrow (it's 10:41 PM here). I cannot open the file you posted due to my older version. I see you are using SW2010 SP4.0 - is it possible for you to upload a version compatible with 2008? - if not, then i would appreciate a screenshot or the like for me to see. Sorry, I did not even think about that. I do not have version 2008 any more, so there isn't much I can do for you. Thank you. I suspect you are able to obtain a good result if your spiral is of better resolution. I've used Insert-->curve-->curve through XYZ to make mine via the attached txt file. It can be imported from the wizard. I had a hard time getting the nautilus to end up close wall-to-wall, which it seems you haven't. Guess i need the parameter you pointed out. Will have a go at it after school tomorrow and give some feedback on how i did. I do not think you need to model every "rib". Simply model less than one per full revolution. I have attached a model and I have shown some screenshots where I create a rib every 1/2 model, but it should be able to be done with as few as 4 lofts. The key is the "centerline" option with loft. Note that my attached model still has some issue at each boundary condition between each segment. Maybe someone else has some thoughts on how to clean that up? For the above image, I tried to create it with only 4 sketches. It turns out that this creates each segment being slightly larger than a full turn. SolidWorks often has trouble with lofts that are self-intersecting, so you need to reduce it down to less than full turns. I ended up just cutting each in half, but with better placement you could just move each of the ones above counter-clockwise about 10 degrees each. After adding the opposite side as well, you can see that I have selected the "centerline" option, which is what you need for this method to work well. And here is the finished shape. Note that the diameter is set mathematically and is tied directly to the path. It will approach zero (infinitely small diameter) as it nears the middle, so you need to cheat when you get to the center and have it stop reducing in size. I also was only able to apply a fillet of 5mm, which is too little. With time spent fixing the transitions between elements, and hand editing a variable-rate fillet, you can get a much nicer fillet. But that takes too much time for me to do now; I will leave that up to you. Attached is the file in 2009 and a couple of screenshots for those that cant open 2009. I have experienced similar issues when trying to create volutes for centrifugal pumps. Loft features in SW can take on a life of their own. Charles Culp created a rough approximation of your B&W speaker, but I don't think that with a lot more work he could ever make it look like the B&W speaker. For some reason the curve generation is not smooth. I was lucky with a pump volute because it did not need to spiral down to "nothing" like a naulitus. While I would start with the same spiral guide curve that you are using, I would break my nautilus into maybe 50 distinct lofts (based upon the number of ribs on your model) so that I can adjust the diameter of the nautilus as needed. I could also then add the rib features between each loft without too much difficulty. 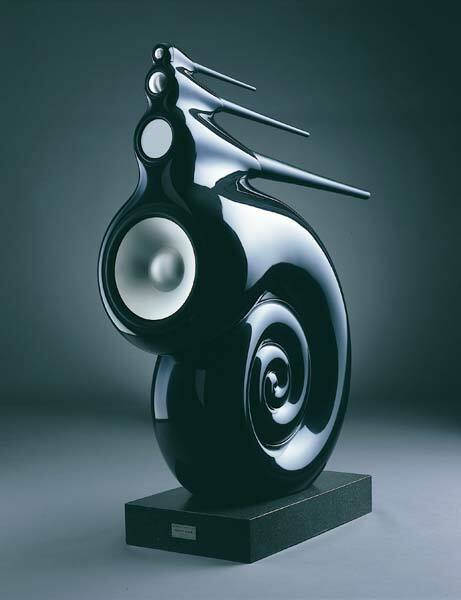 This may sound like a lot of work, but it does give you control at each step and enables you to get to the finish line with the result that looks like B&W's nautilus speaker. Trying to accomplish this with one step would be incredibly difficult in SW. I will add to my post as follows: The actual model is a tapered tube that is just rolled up to form the nautilus. In reality the tube cannot overlap itself. But in SW I do not believe that you can specify this parameter. There would need to be a command like wrap tight, or wrap to a 6mm gap to allow for the ribs. I am still on SW2009 so I do not know if this capability may exist in SW 2010........but if not it would be a great enhancement request. Yeah, i've just tried to do it but it seems the loft feature needs a lot of small sections to provide a decent output. The reason why i'm doing this is because i want to measure the internal volume (Which is an important parameter when choosing a speaker driver) and possibly export to Ansys 12.1 to investigate both mechanical loads and the flow inside via CFD analysis, which is the main topic of my semester. I'm just doing this as a side project to hone my skills because i find it a valuable skill to have as an engineer, even though we don't have any lectures in CAD-modelling. One way of achieving what i want could possibly be doing the following and lay out points for every 5 degrees, which to use for making a plane on the curve, and then continuing onwards making the ribs. Then possibly use a suitable surfaceing feature to connect the ribs to form a solid body. It is rough example. Examine this. 2. Create sketch for plane. 3. Create sketch for path. 4. Create sketch for guide. 5. Create sketch for profile. Insert two points. Set Coincident relations with circle and points. Set PiercePoint relations with first point and path. Set PiercePoint relations with second point and path. Thank you all for your help. I really wish i could award points to more than one answer because not only one person deserves it. Re: How do I create a circular, swirled seashell like shape in SolidWorks? Re: Can someone help me with a model that i'm creating !? Re: How to create a spiral sweep that thins out/tapers at the ends as it intersects with itself.